After a little white lie about losing her virginity gets out, a clean cut high school girl (Emma Stone) sees her life paralleling Hester Prynne's in The Scarlet Letter, which she is currently studying in school – until she decides to use the rumor mill to advance her social and financial standing. Download Easy A in Digital HD from the iTunes store. Easy A images are © Screen Gems. All Rights Reserved. In the spirit of such films as Sixteen Candles, Can't Buy Me Love, 10 Things I Hate About You, and 13 Going on 30, Screen Gems releases Easy A, starring Emma Stone on audiences this week. 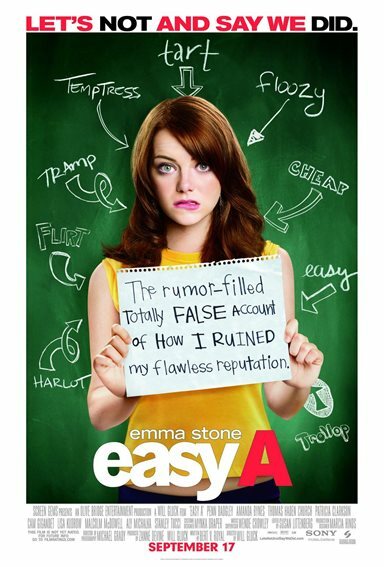 Easy A premise is simple enough -- a modern-day telling of the Scarlet Letter. Olive (Emma Stone, SuperBad, Zombieland) is a simple high school student, who tells after a series of mishaps is branded with a figurative (and literal) scarlet letter by her classmates. The story is an amazing "becoming-of-age" film in the likes we have not seen since the 1999 remake of Shakespeare Taming of The Shrew, and 10 Things I Hate About You. The cast is superb, the dialog is quick witted, and the story moves along at a good pace. What truly makes this film work is the amazing ensemble cast headed by Emma Stone in her first leading role. The cast is simply made to work together. From the jealous best friend, (Alyson Michalka, Band Slam), the 13 Going on 30 Mark Ruffallo emulating Penn Badgley(Gossip Girl), to the perfect little religious school girl (Amanda Byrnes, What A Girl Wants, Big Fat Liar); everyone plays their part to perfection as if they where made for their respective roles. Emma Stone easily pulls off the leading lady role with ease, and one can definitely see why she will be a big star in Hollywood for a long time to come. However, the film is also a sad swan song for the great Amanda Byrnes regrettably because this is her last film as she is retiring from acting. At the end of the day, with a soundtrack that you will be humming when you leaving the theater, Easy A is a great feel-good movie that will leave you Walking on Sunshine the rest of the weekend, and probably wanting to rent a good John Hughes film to round out the day.